11:16 on the MTRainbow chart the 110 EXMA is slowing its rate of decline- a bullish "curl"
9:53 I must admit to being cautious today-the past few Fridays have been lousy trading. 8/1/2008 1:00:31 PM Mountain TG:: playing the 3:00 tide turn. Placing a buy stop at 62.25. 8/1/2008 12:48:44 PM Mountain TG:: Harry's shakin every one loose before he decides to rally or tank. 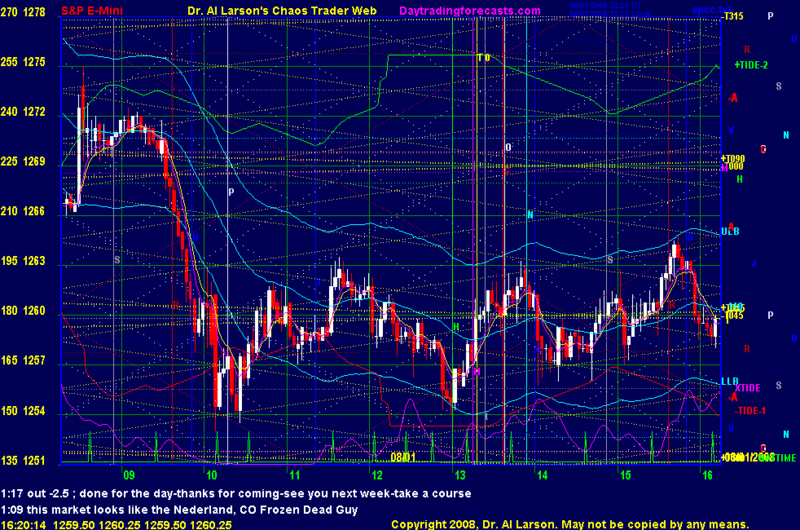 I think the spike low near 10am was indeed a clamshell low and we've got a complicated up fractal underway. 8/1/2008 7:29:41 AM Mountain NPT:: I got that sound when I change to another page (e.g. change from SP1day to SPKISS) or when I refresh the page. Which is normal. 8/1/2008 7:20:28 AM Mountain ah:: ? 8/1/2008 7:12:23 AM Mountain ah:: i keep getting an larm sound but cant seem to find any comments.. anyone got any idea why ?